What is death? It is the biggest restriction and the greatest freedom. Many people think that when they die, they will be free. Only one, who knows the laws of entering and going out freely of his body, will be free. One, who does not know these laws, is tied to his body. Such a person is not free even after his death. He is in great restrictions. Why? He himself has connected by thousands of threads for the tearing of which, conscious, reasonable work is needed. However, God has bound humans only by one thread - Love. While in the world, thanks to the connections, with which one has bound himself alone, one aims at the center of Earth. When he thinks something about the center of the Sun, he feels that the earthly threads pull him strongly downwards. This is the reason why the aspiration of humans for Earth is greater than that for the Sun. To be spiritual, this implies one to have a strong desire for God, for the Sun of life. If this striving in him is natural, by conscious and hard work on himself, he can gradually tear one after another the connections that hold him to Earth and remain only with the connection with God – with the connection of Love. Only that person can be absolutely free after death. He will be free on Earth and in Heaven. He can go to the Sun and return whenever he wants. A day will come when people will communicate directly with the Sun and will know everything that happens there. Is the yoke needed in life? Under the current conditions of life, yoke is needed. It leads one to suffering and work. As modern humans have penetrated deeply into the matter and connected with it, they suffer until they tear these connections. After that one starts to work and finally his life is given meaning. Once your life is given meaning, you already work. A chicken also suffers while it is in the shell of the egg. When the time for hatching comes close, it starts knocking on the shell until it breaks it and goes out to freedom. And in free life, there is also yoke, but the chicken is already working to earn its living. All people are closed in a shell, from which they must come out. Until one does not feel it, he is standing in the shell quietly and calmly. Once he becomes bored with it, he begins to make attempts to break through it and go out. It is important for him to obey the time of its drilling. If he breaks it prematurely, he will either die or he will come out, but he will be feeble and incapable of independent life. Be sure to break the shell in time! We call this moment in life “gaining of freedom”, “entry into the new life”, and the alchemists call it “acquisition of the Philosopher's Stone” and it is mentioned in the Gospel as entrance of humans in the Kingdom of God. So, we have come on Earth to get rid of the unnecessary connections that we have and that make us very nervous. And when we get rid of the connections, only one connection will remain. Then that Divine joy will come in us and we will understand what the physical life means. Physical life is preparation for the spiritual life, and the spiritual life is preparation for the Divine one. Once you get into the perfection of the Divine life, then you will understand the meaning of the physical, spiritual and Divine lives. Joy comes from the Divine life. Not many people in the world live in the full sense of the word. Some people live, but their life is only suffering, others live and vegetate or live and die or live and rise. Getting up is for the body; revival is for the heart; resurrection is for the mind. The mind must rise; the heart has to revive; the body – to get up. One, who gets up is strong; who revives is warm; who rises is smart. One of the fundamental laws of life states that everything that you have received for nothing from God, you shall give it for nothing. When you come to Love, you begin to think of gaining something and to emphasize that you love a person. This is a misunderstanding of Love. There is no need of emphasizing that you love. If you love, you will revive, i.e. you will awake. This is the first manifestation of Love. Then you will get up - the second manifestation. And finally, you will rise - the third manifestation. Till resurrection, Love has not manifested in its fullness. You say you live, but you have joys and sorrows that evoke contradictions. Then you will ask yourself, what the reason for joys and sorrows is. Until you have not risen, you will have both joys and sorrows. “I awoke.” You will awake, but you will still have contradictions. You will get up – you will still have contradictions. Once you rise, you will have completed one process in you and will realize that what you have taken for nothing, you will give it for nothing. Resurrection in the physical world is the new life of humans. In the spiritual world, resurrection means the coming of Love on Earth. In the Divine world, resurrection means the descent of the Spirit on Earth. Therefore, one must rise in the three worlds: his body is to rise; his soul is to rise and his spirit is to rise. This is the true resurrection. In resurrection, life goes from one phase to another, where death is excluded. The law is such. What is resurrection? It is entrance of life in the new conditions, in which the new life may manifest. And they ask, “How will people rise? With these bodies or with other bodies?” They do not understand the question - resurrection concerns only the soul. It is awakening of consciousness. If consciousness does not awake in you, there is no resurrection. The only desire of all beings is to pass from the life of limitations to the life of freedom or as I say - to pass from temporary to eternal life. These are immortal things or as I call them, these are things or life, in which death does not enter. And if death does not enter, humans are free there. There is no suffering, no deprivation, no poverty, and no restrictions. The life of eternal joy and of eternal happiness is there, where humans know how to live. The word “resurrection” contains a great idea in itself. It contains Divine secrets. To rise - it means to be a master of all elements, of all powers, of all thoughts, of all desires, and of all your actions. And how one may rise if he is not a master of all these things? If a frog or a snake can frighten you, how do you prepare for resurrection? One, who has learned to release his mind, is over death. One can never have outside what he has not inside. In order one to be healthy, it means him to have a right and sober way of thinking. If the spirit of somebody is not healthy and strong, the body cannot be healthy, either. The spirit in you is the thing that includes everything. The spirit of modern people is not so powerful, due to the frequent split of their minds. No matter what they do, they cannot avoid that split mind. For now, it is an inevitable law. The split of mind corresponds to the existence of day and night in Nature. No matter what you do, your mind will always move between the poles - day and night, light and darkness. By passing through these processes, the human consciousness is gradually awaking. When one’s consciousness awakens, we say that he has risen. Resurrection implies acquiring of immortality. People need to recreate their lives according to the primary life that is embedded in them. Only in that state we can become immortal. It is the desire of God. One of the important laws of Nature is that it does not tolerate any excess of matter or energy. It does not tolerate any accumulations, any deposits. Energy and matter can be stored, but not accumulated. For example, if the human brain gathers more energy than it is needed for a certain moment, it must have a reservoir, where it to be stored. Sometimes one has more thoughts, feelings and desires than he needs at a moment, due to which he must store them somewhere. All that one stores in himself is secondary. Primary things in people are those basic thoughts and feelings, with which he came out from the Primary source of life. One comes to Earth and leaves with the basic thoughts and feelings that no one can take away. They represent the main capital of his life, and the secondary ones are a borrowed capital. One must sustain his basic idea and never give it up. If secondary ideas come at the place of the basic one, one feels burdened by surpluses and due to this he loses his plasticity. Resurrection incorporates another law – passing of the soul into that real state, in which it has existed before its incarnation into the matter. Once incarnated in the matter, the soul becomes corrupted. Moreover, all people, without exception, are unclean. Therefore, we must make great efforts on Earth to be able to clean our hearts, our minds, our actions and desires of that mud by the power of the spirit. The reason for the mud is the matter itself - so it is of such a nature that it becomes corrupted. Resurrection is the process of cleaning itself. It takes place only through the Divine Love. Without Love there is no resurrection. One, who becomes to know the good, he will have life in himself; one, who becomes to know evil, he will have death in himself. If you know the good, you revive; if you know the evil, you die. Then, what happens if we have plus and minus? If you are born, it is the good. A person dies - it is the evil. One is born - it is the good again. One dies - it is the evil again. They alternate repeatedly. When you become to know the attitude of the good and the attitude of the evil, you will rise over these conditions and then evil will not counteract you as it does now. You have a clear idea, don’t you? Let's say a river has a strong current. A bird that flies is free of the current, but a person, if he does not fly and if he falls in that water, he can drown. A bird can fly freely over the stream. One, who thinks, rises. One, by his thought, rises like a bird over the current of evil. Evil is a powerful current. Thoughts are winged. One, who thinks, has wings that make him free and evil does not affect him. You ask, “Why does evil exist?” Evil exists. There are completely different reasons, but evil shall not affect us. In order it not to affect us, we must have wings. We need to understand the law. Aim at resurrection as an internal process. This means one to get rid of all doubts and limitations. Believe in your mind and in your heart, in your spirit and in your soul, which God has put in you and you will rise. Therefore, if you have good treasure in yourself, you have to admit, if you have evil treasure; fertilize your life with it to turn it into good. This is the thought that Jesus put in the verse for the good and evil treasure. A person, whose consciousness is awakened, can never die. Modern humans are infected by the thought that one cannot rise to life, cannot be born again. The greatest deception in the world is namely there - one can rise as he can die. Death and life are two relative things. If you come in conflict with the powers, with the laws that operate in the rational Nature, you will be crushed, destroyed. If you come to agreement with the powers, with the laws of the rational Nature, you will be risen; you will rise from the grave. While people do not accept the teaching of Jesus, death will not be liquidated. Now you have come and you all want to be happy. Modern history has not seen a better person than Jesus. What did it happen to Him, tell me! A most horrible death came to Him. Did He give up? If Jesus had given up His fate, what would the modern humanity have been? It would have been a complete hell. If we, modern people, refuse to accept God in our spirits, if we refuse to accept God in our souls, if we refuse to accept God in our minds, if we refuse to accept God in our hearts, what will happen with us? A whole hell will form. If we decide to accept God and to live according to God, we will have the condition, about which it is written in the Scripture: “Here comes a new Earth and a new Heaven.” New life of immortality - this is what they call the first resurrection. Those, who accept God in this way, will enter the first resurrection. When Jesus is born in your soul, you will be useful both for yourself and for those around you. This is a resurrection. This means awakening of the human soul. When Jesus lives in the souls of people, everybody will revive, will get up and will hold out their hands to each other like brothers. Solomon turned and saw all violence and sufferings of the people under the Sun and there was no one to comfort them; there was no one to save them. However, the issue remained unsolved in the mind of Solomon. Solomon says that it is so – there is no one to comfort you; there is no one to save you. And finally, when there is no one to comfort and save you, at least eat and drink then. When there is no a comforter and a savior, you will at least drink and eat and then it does not matter what happens. So far, everybody follow the rules of Solomon and live according to them. However, Jesus said, “I am the living bread, which has come down from Heaven. One, who eats Me and who believes in Me, will revive.” They ask, “When will this happen? It can happen even today! If you come to believe, you may revive even today. Presently, some people wait for Jesus to come to rise. Future resurrection is for children. The present resurrection is for the wise people, and the past resurrection is for old people. Those of you, who want to be educated people, should not be discouraged. In each discouragement, you should see an opportunity, from which you can go out. The genius is there. You should know that even in the greatest trial, even in death, there is a place, there is a new way, through which you can go out. One, who can do that, he is a strong man and he does not die. Jesus verified that law. He checked that even if a person dies, there is a way out. When they crucified Him, he died. What does the Gospel say? Didn’t His life come back? They put Him in the grave and the dead person found a way out and came out of the grave. Someone may say, “God did it.” No. I know that when he is dying, he still believes that he can live. Modern people constantly worry and say, “What will we do for tomorrow?” I say: if people die from surfeit and crimes, why wouldn’t we die of hunger? If we must die, let’s die hungry. Doesn’t an ill person suffer? He does. I will also suffer, but I will know that I have not done harm to anybody. There is a difference between that one and me. When I die with that consciousness, I will revive, but when he dies with that consciousness - he remains there. There is a fact in Nature - the fact that a righteous person rises, and by now, there is no example of a sinful person, who has risen. A righteous person always rises in the world – this means that he has revived, that he has returned in life again. Jesus is the sublime consciousness of humans, which, in order to form, there must be an internal support. The internal support is the human spirit, which determines his immortality. One, who does not have this internal support, he cannot be immortal. The rational beings do not live only in the air. The environment, in which they live, is called ether by them. There is something, there is one situation, in which a person can become immortal. By entering in the relevant environment, one becomes immortal. Then, even if you want to die, it would be impossible . If you want to die, you will go down to Earth. If you do not want to die, you will go up in your consciousness; you will rise. The last day is the day, on which the great life starts. The great, the infinite, this what has meaning in itself, always starts from the last day. And therefore, each of you, who does not start with that last day, he cannot reach to that great, Divine science that God has ordained and put in the bosom of Nature, i.e. to those goods that are prepared for His chosen children, who live on Earth today. So far, they have preached to you always about Heaven and you all are preparing for Heaven; you imagine Heaven, the angels, and the saints in various ways. But all these things are not defined in your minds. Have you ever been to Heaven? Have you? You have not. When I say that you have not been, I mean in the form of your present consciousness, and not of your past one. You have not been in Heaven with that consciousness. And when someone says that he has been to Heaven, we understand not as he is now, but it is another consciousness – the superconsciousness, through which he can enter. Resurrection is a transitional state of subconscious life to conscious and superconscious life. When a lower animal passes from subconscious to conscious life, the self-consciousness that originates is resurrection. It is revival. Therefore, in the present life, self-consciousness in you is needed for you to correct your past and present mistakes and replace them by something reasonable. Your life is not the one that you expect. When you realize all your mistakes, all those shortcomings and deficits of this life, and the sufferings, which are due to ignorance of these laws, then you will prepare for the resurrection. You will finally choose to go out as a frog from that swamp, which is already dry. While one thinks that no change happens in his life, he lives in the process of subconsciousness. The current white race will go to full consciousness and not to awakening and falling asleep. This is a connection of the superconsciousness. It is resurrection, it is already the new life. If you decide today to awaken that self-consciousness, you may rise. It is said that faith rises. It relates to the human mind. Therefore, resurrection implies acquiring of light. When you need faith, you will say, “God, fill me with faith!” Faith is not given, it fills people. When you need Love, you will say, “God, unite me with Love!” So life is acquired through hope, resurrection - through faith, and union - through Love. Today people need new understandings, new views about things, new faith. And faith has degrees: gullibility, superstition, belief and faith. Faith finally turns into knowledge. Knowledge, however, does not foresee accumulation. Accumulating knowledge does not yet imply application. It is unnecessary ballast, of which one must get rid. True knowledge is the one that has applications. For example, they say that someone has died. They know that he is dead, but do not know what may happen with him after that. This is not knowledge. One, who knows things, he will immediately find out if that person is sleeping or is really dead, if he will rise or not. All people cannot be alive, but everyone can rise. This is a law. Jesus has never died. Therefore, it can be helped only to one, who understands the law of resurrection and believes in it. There should be enough oxygen in the pure blood without toxins. The oxygen of the human mind, of the human heart and of the human will makes the blood clean. Blood carries all goods. We create a nice liquid - the elixir of life by our thoughts. 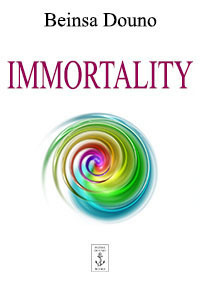 Some people look for immortality. Immortality originates from three factors: the absolute right thought, the absolute right feeling and the absolute right act. They are important for immortality. So we must learn to think. Our thoughts are to be clean. “Is that possible?” It is possible even today. Some of you may rise even today. Daniel, one of the most prominent people of the past, said, “In the last days, when people would get rid of all their wrong ideas of life, then there will be resurrection.” People will rise. Now, everybody still strive to keep this order. Everything you see now will disappear. You will find nothing of this order, which exists now. Not that I want it, but as you cannot find even a piece of the Holy Cross so everything will change. Scripture says: everything will go through fire and this culture and architecture will all be swept away, everything will change. Only that thing of the culture that we have kept in us will remain in humans. It will remain. Anything else that is external will disappear. And what we have kept will give birth to the new culture that will be a thousand times higher than the current one. This is the nearest thing that is knocking on the door now. When a person may rise? When he enters to live in the Divine day. While he is the human day, no resurrection can be expected. This does not happen like that. Earth shall turn millions of times until one enters the Divine day of life and rises. When it comes to self-determination of his consciousness, one has already entered in the Divine day, where resurrection expects him. In this situation, he has in himself everything most beautiful and greatest. This is a human being in the full sense of the word that has got up, revived and rose. This is a person, who serves God after all rules. Until you have not passed through the processes “getting up”, “revival” and “resurrection”, you are not yet a completed process. Getting up means collection of materials for building. Revival implies development of the body, and resurrection - development of consciousness. Resurrection implies the new, cosmic consciousness in people that will come. Then new light will occur in everybody and they will become aware that they are brothers to one another. They will realize that both stupid and educated people are one and the same for God. Resurrection is a process that the Spirit of God performs in our lives. It is a great process, by which God restores that original harmony. One day, when your ears open and you start to listen a little more and from a bigger distance than now - now they are very thick; you even have not musical skills; you get only the roughest tones - you will notice that some tones that the objects - fountains, trees, leaves – give out move throughout the entire universe and you will hear great music that spreads from one end of the world to the other and then you will understand the internal meaning of life.